The Obama administration and Hobby Lobby, the Chick-fil-A of craft stores, are taking their fight over reproductive health care all the way to the top. 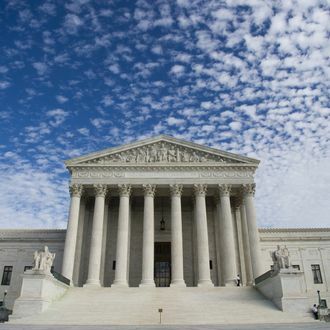 The Supreme Court agreed today to hear the case involving the Affordable Care Act’s requirement that large enough employers must cover birth-control and other reproductive-health costs for their employees. Hobby Lobby — in addition to about 100 plaintiffs in similar lawsuits — claims its “religious liberty” is being impeded upon. At its core, the issue is whether or not the First Amendment applies to corporations as well as people. Three federal appeals courts have ruled in favor of Hobby Lobby, whose Christian owners believe that certain birth-control drugs are the same as abortion, while two appeals courts have upheld the Obamacare rule, leaving it to the Supreme Court. “We believe wholeheartedly that it is by God’s grace and provision that Hobby Lobby has been successful. Therefore we seek to honor Him in all that we do,” said founder David Green.